A chandelle is a maximum performance, 180° climbing turn that begins from approximately straight-and-level flight and concludes with the airplane in a wings-level, nose-high attitude just above stall speed. 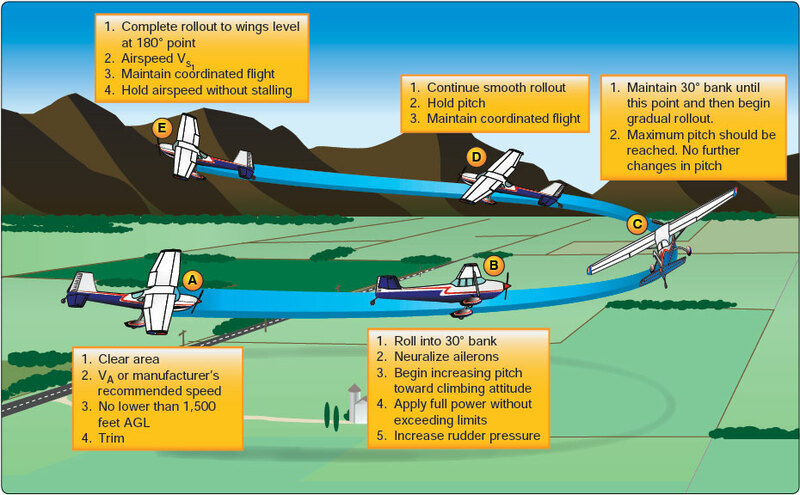 [Figure 9-3] The goal is to gain the most altitude possible for a given bank angle and power setting; however, the standard used to judge the maneuver is not the amount of altitude gained, but by the pilot’s proficiency as it pertains to maximizing climb performance for the power and bank selected, as well as the skill demonstrated. A chandelle is best described in two specific phases: the first 90° of turn and the second 90° of turn. The first 90° of turn is described as constant bank and changing pitch; and the second 90° as constant pitch and changing bank. During the first 90°, the pilot will set the bank angle, increase power and pitch at a rate so that maximum pitch-up is set at the completion of the first 90°. If the pitch is not correct, the airplane’s airspeed is either above stall speed or the airplane may aerodynamically stall prior to the completion of the maneuver. Starting at the 90° point, the pilot begins a slow and coordinated constant rate rollout so as to have the wings level when the airplane is at the 180° point while maintaining the constant pitch attitude set in the first 90°. If the rate of rollout is too rapid or sluggish, the airplane either does not complete or exceeds the 180° turn as the wings come level to the horizon. Since the airspeed is constantly decreasing throughout the chandelle, the effects of left turning tendencies, such as P-factor, becomes more apparent. As airspeed decreases, right-rudder pressure is progressively increased to ensure that the airplane remains in coordinated flight. The pilot should maintain coordinated flight by sensing slipping or skidding pressures applied to the controls and by quick glances to the ball in the turn-and-slip or turn coordinator. At the 90° point, the pilot should begin to smoothly roll out of the bank at a constant rate while maintaining the pitch attitude set in the first 90°. While the angle of bank is fixed during the first 90°, recall that as airspeed decreases, the overbanking tendency increases. [Figure 9-3C] As a result, proper use of the ailerons allows the bank to remain at a fixed angle until rollout is begun at the start of the final 90°. As the rollout continues, the vertical component of lift increases; therefore, a slight release of elevator back pressure is required to keep the pitch attitude from increasing. When the airspeed is slowest, near the completion of the chandelle, right rudder pressure is significant, especially when rolling out from a left chandelle due to left adverse yaw and left turning tendencies, such as P-factor. [Figure 9-3D] When rolling out from a right chandelle, the yawing moment is to the right, which partially cancels some of the left turning tendency’s effect. Depending on the airplane, either very little left rudder or a reduction in right rudder pressure is required during the rollout from a right chandelle. At the completion of 180° of turn, the wings should be leveled to the horizon, the airspeed should be just above stall speed, and the airplane’s pitch high attitude should be held momentarily. [Figure 9-3E] Once demonstrated that the airplane is in controlled flight, the pitch attitude may be reduced and the airplane returned to straight-and-level cruise flight.